Attending Hassan Rouhani’s inauguration in the midst of a series of revelations is morally and politically unconscionable, writes Alejo Vidal-Quadras, as it suggests the EU will look the other way on actual abuses as long as there are pleasant-sounding promises coming out of a small faction within the Iranian regime. On Wednesday 2 August, Amnesty International issued a new report on the systematic human rights abuses being carried out by the Islamic Republic of Iran. One might expect that the organisation’s reporting will help to keep pressure on global policymakers over the need for confronting the repressive regime in Tehran. Yet, no matter how much the world has been reminded of the true nature of that regime, some seem incapable of moving beyond the conciliatory posture that defined Western relations with Iran at the time of the 2015 nuclear deal. The Joint Comprehensive Plan of Action was deemed a success in part because various European leaders, along with then-US President Barack Obama, believed that it would set the stage for broader rapprochement between Iran and the world. What’s more, there was substantial talk about the possibility of Iran adopting a trend toward moderation after it saw the potential benefits of working with the international community. 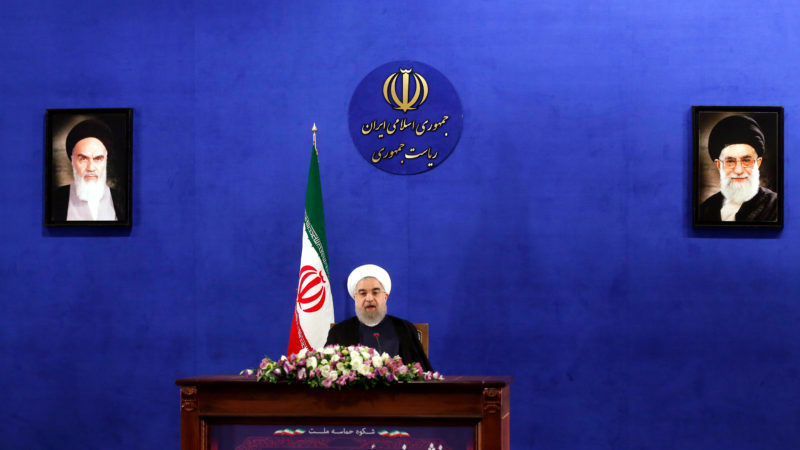 Much of this talk was motivated by the supposedly moderate credentials of Iranian President Hassan Rouhani, who took office in 2013 and played an instrumental role in securing the nuclear deal. In May of this year, Rouhani won reelection for a second term, which begins this week. Four-year-old promises of reform re-emerged in the context of his reelection campaign and were embraced all over again by certain European Governments. This has been made clear by the announcement of EU High Representative Federica Mogherini that she would travel to Tehran on 5 August to attend the ceremonies celebrating Rouhani’s second inauguration. This sends exactly the wrong message, namely that the European Union still trusts the Iranian president to pursue positive changes in his country, even after four years of failing to do so. The depth of that failure has been very specifically highlighted by the Amnesty International report, which points out that the Islamic Republic had been engaged in a “vicious crackdown” on human rights activism and socio-political dissent throughout the entirety of Rouhani’s first term. Iranian authorities like the Revolutionary Guards and the Intelligence Ministry have steadily lowered the threshold for what constitutes national security crimes, and the supposedly independent judiciary has dutifully gone along with this trend by meting out worse and worse punishments for activities that would not be deemed unlawful in any civilized, democratic country. Amnesty International clarified its observations with references to several specific cases, in which human rights activists have received sentences well in excess of 10 years in prison, simply for communicating known abuses to the international community. The report condenses the current state of human rights into an easily digestible call to action, but its contents should come as a surprise to no one who has been paying attention to Iranian affairs in recent years. And of course, anyone who saw fit to respond to an invitation to Rouhani’s inauguration should have been paying such attention. Even among those Iranian citizens who viewed Rouhani’s initial election campaign with optimism, their well-founded disillusionment came quickly with increase in executions in an alarming rate. That disillusionment continued to build as Rouhani oversaw the worst period of executions in 25 years, after appointing as Justice Minister an individual who had played a leading role in the massacre of 30,000 political prisoners in the summer of 1988. It is shocking that the Rouhani administration retained the support of any Western policymakers after the appointment of Mostafa Pourmohammadi. It was more shocking when that support survived the Justice Minister’s declaration last year that he was proud of his role in the massacre, which aimed at carrying out “God’s command” of death for supporters of the leading Iranian opposition group, the People’s Mojahedin Organisation of Iran (PMOI/MEK). And it is similarly shocking that Western officials would still be willing to attend Rouhani’s inauguration after the Amnesty report highlighted how thoroughly he has failed to live up to naïve expectations of reform. To make matters worse, the report coincided with the revelation that instances of hanging are surging once again in the Islamic Republic, which already has a secure reputation as the country with the single largest per-capita rate of executions in the world. In July alone, at least 101 people were put to death in this fashion, with others likely being killed in secret. Maryam Rajavi, the president of the Iranian opposition coalition NCRI, responded to this new wave of executions by saying that such unbridled barbarism in the 21st Century is a great test for the international community to prove whether it adheres to the universal principles of human rights or sacrifices them for economic and political considerations. She said that the mullahs’ religious dictatorship is the disgrace of contemporary humanity and must be rejected by the international community. Members of the European Parliament have also criticised the planned visit of Mogherini to Iran following the Amnesty International report. Attending Rouhani’s inauguration in the midst of these revelations is morally and politically unconscionable. It sends exactly the opposite message about international commitments, implying that the European Union will look the other way on actual abuses as long as there are pleasant-sounding promises coming out of a small faction within the Iranian regime. Is this the image that the EU policy makers want to convey from Europe to the average citizen in the streets of Tehran? EU needs to be more honest. We have 28 Member States who all have abolished death penalty. EU says it advocates abolition of death penalty as a core principle all around the world. How can then EU leaders be shaking hands with World’s No 1 Executioner state? 3000 people hanged by Rouhani during his first term and Mogherini is only worried about business. What a great example to the rest of the world to follow!! It’s a disgrace for Mogherini to be attending the inauguration of a dictator. There is no such thing as a free election in a country where half the country are barred from standing as a Presidential candidate, and those who do stand have to be vetted by a Guardian Council (mullahs’ appointed by the Supreme Leader) for their loyalty to absolute religious rule. Anyone who even slightly criticizes the Supreme Leader is barred (and worse still faces arrest and torture). I forgot to mention 3,000 people were hanged in Iran during Rouhani’s first term in office. So what’s the EU’s top diplomat doing in Iran endorsing all this? Mogherini should express her concerns about human rights and women rights publicly with Iran medias . Only this can justify her trip.